The easiest way to clean filter cartridges . . . automatically!!! 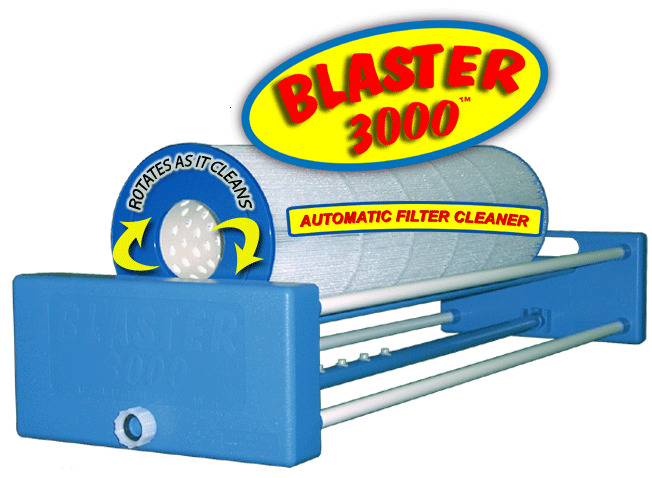 Scroll down to browse through information on The BLASTER Automatic Filter Cartridge Cleaners. Available in 3 sizes: accommodates all common Pool and Spa filter cartridges sizes. The Website Store Directory contains an alphabetized listing of all products for sale. We don't just sell products. We help you make a better-informed choice, by providing all the information, you might require. Need ordering help? Scroll down the page, for the Order Desk Telephone Help Number. All items ordered will end up in the same shopping cart, no matter which page of this website, the items are located. All Major Credit Cards and PayPal are accepted. Order one today. Three (3) models accommodate all Pool and Spa Filter Cartridge sizes. 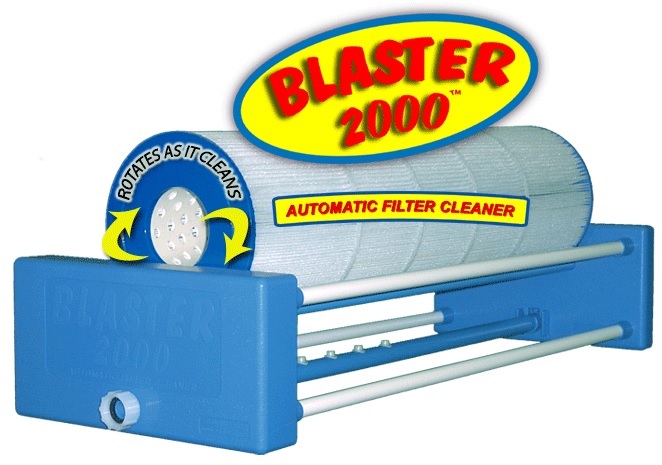 THE BLASTER Automatic Filter Cartridge Cleaners will automatically rotate your swimming pool or spa filter cartridge, while PowerJets spray focused water, to clean the filter pleats. 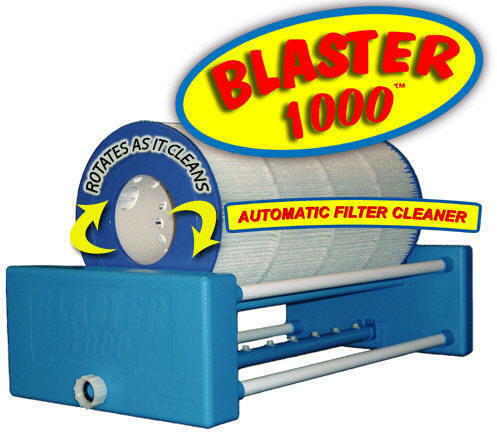 THE BLASTER Automatic Filter Cartridge Cleaners feature a unique horizontal orientation, that allows dirt and debris to fall away from the rotating filter cartridge. Avoids the embedding and lodging of dirt, that can result with vertical cleaning. THE BLASTER Automatic Filter Cartridge Cleaners can be used with Ceramic Spa Filters, so long as the diameter is at least 6-inches (15 cm). After placing your order, please let email us at askalanaquestion@msn.com and we will include a pair of grip sleeves, that provide better performance, at no additional charge. A cleaner filter cartridge in less time and the opportunity for better water quality too! Available in 3 sizes to accommodate popular-sized, pool or spa filter cartridges. Simply attach to a garden hose, place the filter on top, and turn the water on, to begin the rotating cleaning action. Watch the dirt simply fall and wash away. Works with Ceramic Spa Filters, with diameters of at least 6-inches (15 cm). Please e-mail us at askalanaquestion@msn.com and we'll include a pair of grip sleeves, that provide better performance, at no additional charge. Filter cartridge cleaning has never been easier or more effective. Simple attach a garden hose, to the Blaster, and place the filter cartridge on top of the rollers. Turn the water on and the rollers start to rotate the filter cartridge, while a series of powerful water jets clean, within the pleats, and wash the dirt away. It's all done, in just a few minutes. A cleaner filter reduces chlorine or bromine usage. THE BLASTER™. . . a better, easier way to clean pool and spa filter cartridges! ● SPRAY JETS: FULL EXTENSION 20"
● Size 24" x 12" x 6" - Weight: 4.0 lbs. Available in 3-sizes, to accommodate virtually all pool and spa filter cartridges. ● SPRAY JETS: PARTIAL EXTENSION 16"
● Size: 31" x 12" x 6" - Weight: 4.6 lbs. Simply attach to a standard garden hose and watch the dirt wash away. ● SPRAY JETS: PARTIAL EXTENSION 18"
New Nano-Technology destroys organic wastes and improves clarity.